This ad appears in Entertainment Weekly. Actually, this exact ad only appears in my copy, I’m assuming. 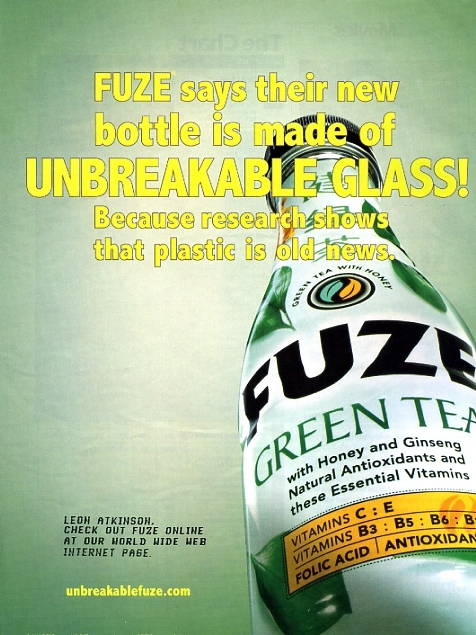 You might not be able to see it from the thumbnail, but in the lower left there’s some text that looks like it came out of a dot matrix printer from 1984 that reads, “LEON ATKINSON, CHECK OUT FUZE ONLINE AT OUR WORLD WIDE WEB INTERNET PAGE.” Nice. Your Internet page is on the world wide web? Online? Really? How do I dial it in? Out of all the people who subscribe to Entertainment Weekly, why did you choose me? And if you know anything about me, you know that I’ve been doing a low carb diet since January–so I really wouldn’t be interested in your junk food drink no matter how many vitamins you put in it. Actually, I’m pretty happy drinking plain green tea, and it’s really, really cheap. This is the yuckiness of direct marketing when it comes to hang out on the Web. The “personalization” that’s being attempted is obviously not genuine. It’s worse than an impersonal broadcast-style ad, which are annoying enough. This ad takes it a step further to purposely insult my intelligence. What’s the psychographic that follows the call-to-action of this ad? Notice the CTA is to go visit the Web site (I didn’t) not to buy the drink. 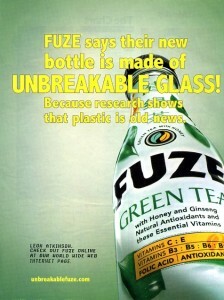 From the very beginning, they are say, “we know we can’t convince you to drink this with a full-page ad in a magazine. Please come to our Web site and subject yourself to more persuation.” Really? I need to go read about a soft drink on a Web site to decide if I want to drink it? Even if I drank sugar water, I wouldn’t want to spend more than about 5 seconds deciding to drink it or not.